The official pro-Brexit campaign for the UK’s EU referendum was fined in July for exceeding its £7m spending limit for the vote. The campaign said at the time the watchdog’s findings were “wholly inaccurate” and politically motivated. The announcement came as MPs rejected Prime Minister Theresa May’s withdrawal agreement on the day the UK had been due to leave the EU. But the Commission found there was “significant evidence of joint working” between Mr Grimes and Vote Leave and that Vote Leave should have declared the spending as its own. 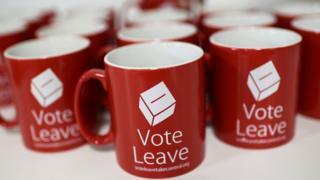 In a statement released to the Daily Mirror, the campaign said: “For almost three years, Vote Leave has successfully fought back against numerous allegations and conspiracy theories, spending almost £1m in the process. “Since July 2018, we have been preparing our appeal against the Electoral Commission’s unwarranted and unsubstantiated finding and fines. “Sadly, we now find ourselves in a position that we do not have the financial resources to carry forward this Appeal, even though we are confident that we would have prevailed on the facts in Court.